Who are we? | Hard hat. Lunch pail. It’s a good time to be a Bulls fan. After living through the Jordan glory years, the depressing 20-win seasons that followed, and the VDN days…it’s a new era of Bulls basketball. 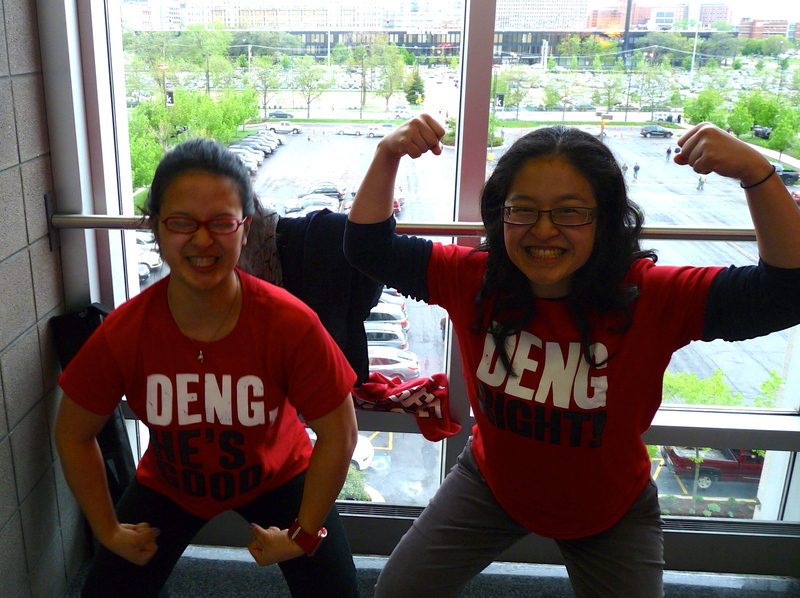 The Yin Seeesters [Joyce on the left, Jocelyn on the right] at the Bulls/Heat ECF in 2011 in our Deng-themed shirts. We’re two Asian American sisters who grew up in the Midwest and are known among our friends as “otherwise sane and rational….except when watching Bulls games.” We now both reside in Washington, DC and occasionally catch Bulls games together and even endure intermittent Wizards game as Joce is a season ticket holder. As you will come to see, Jocelyn is the more rational, knowledgeable and level-headed of the two because she has more experience of living through much of the craziness that is the NBA. With her being a bit older, she has a much clearer memory of the MJ years while Joyce vaguely remembers being confused as to why the other sister was ripping her hair out and screaming at the television during those ‘silly basketball games.’ Joyce is still learning the ins and outs of basketball but has become a much more dedicated Bulls fan within the last few years, developing multiple hernias and gray hairs in the process. Both of us are shorter than Muggsy Bogues so it’s safe to assume that neither of us grew up playing basketball in any organized fashion. This is our disclaimer – we may know what a pick-n-roll looks like but don’t ask us to recreate a zone defense. Why the name, “Hard Hat, Lunch Pail”? 2) Beyond Taj, it’s really the attitude that Tom Thibodeau has instilled in the team. The players always show up to play and unlike the past two years, you get the feeling that they’re in every game, even if they’re down by 25. At the end of the day, this humble team works hard and it’s apparent how grateful they are to be doing what they love every single day of the year. What will I find on this blog? TBD. We haven’t quite narrowed that down yet but for the time being, you can expect the occasional article, live blog/chat of games, video clip, photos, whatever we find interesting on the internets. Between Jocelyn’s logical reasonings and Joyce’s reactionary, obscenity-laced outbursts, we like to think that we offer an entertaining perspective to the world of NBA basketball. How can I send you this awesome Bulls gif I made? Or just, you know, get in contact with you? We love any and all gifs, for the record. Email us at hardhatlunchpail@gmail.com or send us a tweet at @theyinseeesters!